The 3D Real/Virtual World Hybrid: How Far Away? How long will it be until we can stroll through the streets in a virtual world that is identical to our own? Given the state of a number of technologies, not very long. Over the last couple of years we’ve seen Microsoft Street Side and Virtual Earth as well as similar efforts from Google. But different technologies are now being deployed that are even more interesting that the results achieved from large companies taking and processing massive numbers of photos into now-standard 3D views. Two standouts are Microsoft’s Photosynth Project and newcomer Everyscape, which Brady Forest wrote about today on O’Reilly Radar. First, Photosynth. The idea is to take many pictures of a given thing or area and combine them into a 3D image. Fly around it, zoom in whatever. The results are jaw-droppingly beautiful – see the demo video above by Blaise Aguera y Arcas from earlier this year. The BBC also just announced a partnership with Microsoft; they’ve launched a new site using Photosynth technology that will show 3D photographic representations of historic sites around the UK (Ely Cathedral, Burghley House, the Royal Crescent, Bath, the Scottish Parliament buildings and Blackpool Tower Ballroom). For now, though, Photosynth only works on Windows machines. Everyscape is a much simpler product technically but is quite a bit more useful in the near term. They turn regular 2D pictures into 3D images that look like they were taken with special cameras. 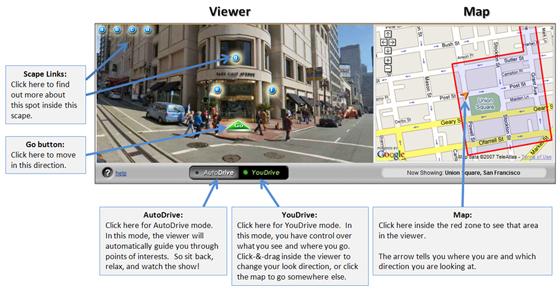 Viewers can pan around a 3D area, and move from point to point. See the demo on their site to get a feel for it. The video at the top of the post was created by founder Mok Oh and seems to show features that go way beyond the early beta version of the product. Everyscape launches this Fall, promising ten cities. Users will also be encouraged to submit their own photos to be included in the models. The company is attacking Google and Microsoft head on in those companies’ efforts to photograph the world and let people meander through it. They may have a chance – there are no special downloads required and they’ll be relying on users to take many or most of the photos used in the service. Whether they make it or not is unclear, but it’s fun to play with these products anyway. Good luck to them. Fotowoosh is another service we’ve covered with much simpler goals than Photosynth or Everyscape: they just turn a single 2D photo into a 3D image. But the results are very cool.